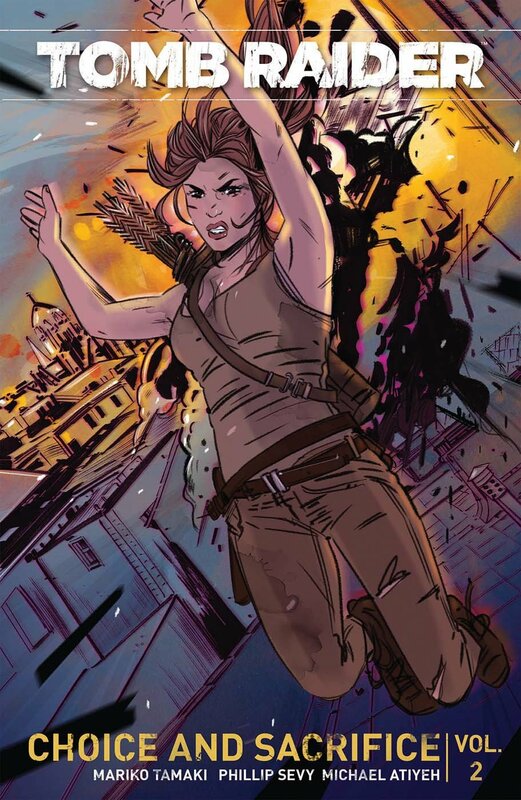 Dark Horse Comics has announced that the Tomb Raider Volume 2: Choice and Sacrifice Trade Paperback, will be out on May 10, 2017 as Print Edition. The Trade Paperback is Written by Mariko Tamaki, Art by Phillip Sevy, Coloring by Michael Atiyeh and Cover by Tula Lotay. Following the events of Rise of the Tomb Raider, Lara Croft’s life hasn’t gotten any easier! When Lara gets word that Sam Nishimura has escaped from a mental hospital, she drops everything to help her friend. But after an encounter with the Order of Trinity, she realizes that things are more complicated than she thought. Haunted by her memories of Yamatai, Lara is determined to rescue her friend. But the specter of Himiko the Sun Queen looms large in Sam’s life, and threatens to consume her completely! Collects issues #7-12. Below is the Preview Cover of the upcoming TPB. Click on the image to enlarge.